Books about schools in the First World War have tended to focus on the public schools and the ‘old boys’ who lost their lives and are commemorated on the memorials that still adorn many a school hall or corridor. 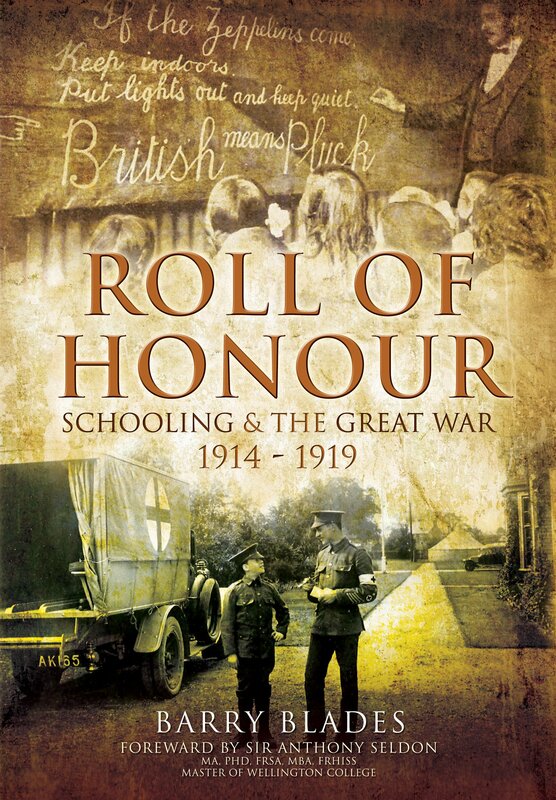 Roll of Honour takes a more holistic approach, examining the impact that ‘total war’ had on schools across the country. The pre-war state of education is used to show how physical fitness and military drill, and the various tales of daring deeds, sacrifice and glory in boys’ magazines, had already started to prepare the generation for war. Pre-war education was a class-based and hierarchical system of schooling. Although the newly recognised secondary schools were growing in number, they often emulated public schools in terms of their culture and ethos. However, the nuances of society are more complex than the stereotypical view of the public school junior officer that many associate with the war. Whilst the public school ethos certainly built up pupil’s character – ‘Duty, loyalty, patriotism and self-sacrifice’ – it was not just these pupils and old boys who clamoured to join up; many schools were affected by the number of teachers who enlisted too. Over 15,000 NUT members (men and women) served. This of course led to an increase in the number of female teachers, but they did not always have an easy ride. Schools did not just provide a breeding ground for potential eager recruits, although headmasters in many cases colluded with (or at least tacitly accepted) those who tried to enlist underage. Blades also examines how schoolchildren were used as almost a ‘reserve force’ who contributed in a wide variety of ways, either through fundraising, the production of items for troops, or even collecting horse chestnuts and acorns that were used in the production of munitions. Often this came at the expense of actual learning; many schools were also requisitioned for use as recruiting stations or billets, or later as hospitals, sometimes in spite of protests about the educational needs of the children. The war came closer to home with the onset of zeppelin and bombing raids. Some families moved as a result and schools had to take on these new pupils. One raid resulted in a devastating direct hit on a school in Poplar in 1917 where 18 pupils were killed and 30 wounded. The majority of the dead were just 5 years old. News of the armistice was gratefully received, but tempered by the impact the effects of the influenza pandemic which ravaged the country and temporarily closed many schools. The book naturally covers remembrance and commemoration, exploring the notion of the ‘lost generation’ and showing how it was not just the public schools that suffered. All schools affected to a greater or lesser extent, and Blades skilfully weaves these stories together to show how almost no aspect of school life remained untouched by the war. The ‘forgotten generation’ not only included the servicemen who returned, but the many bereaved children who had lost fathers and other family members. The depth and breadth of original research in Roll of Honour is evident, and the book is a refreshing and important addition to the centenary offerings thus far.